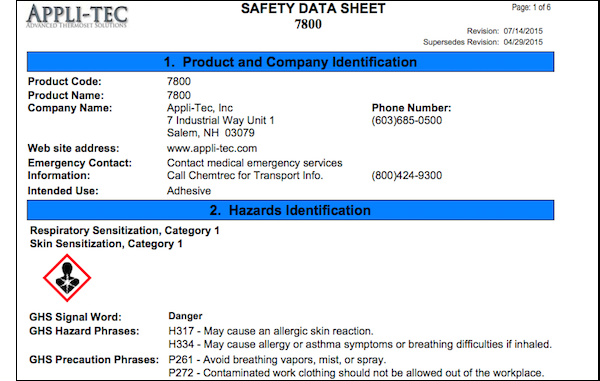 March 7, 2016, Salem NH — As part of meeting OSHA’s Hazard Communication Standard, Appli-Tec created over 850 SDS for its adhesive products. Until recently, if customers wanted an SDS for a precision-mixed and frozen adhesive or other product purchased from Appli-Tec, they had to call customer service. Appli-Tec has announced that customers can now download print-ready SDS directly from the Appli-Tec website. In compliance with GHS regulations, all Appli-Tec adhesive product labels now include the product identifier, which is the same as the product code number. 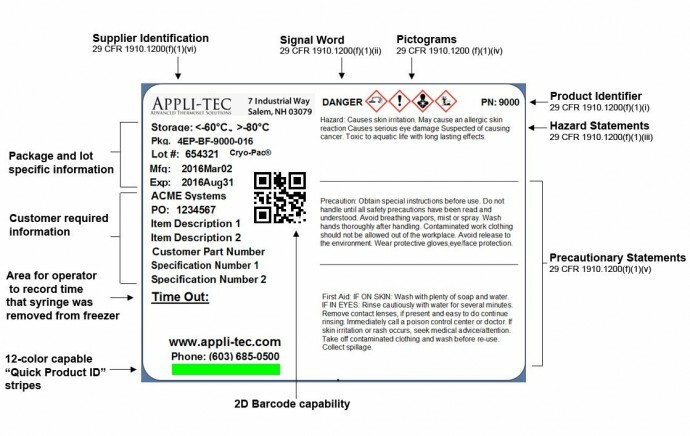 The product identifier or product code number is located in the upper right corner of all Appli-Tec product labels. Once the product code number has been determined, customers simply visit the Appli-Tec SDS page and enter the product identifier (e.g. 7800) in the search box. A new browser tab will open with a PDF of the GHS-compliant SDS. The PDF can be printed and/or saved to a desktop or other device. Appli-Tec’s new labels also include items customers have requested, such as bar codes and “Quick Product ID” color strips. The company also added the new “Time Out” area where customers can record when a PMF adhesive product is removed from the freezer. Based in Salem, NH, Appli-Tec supplies pre-mixed and frozen adhesives to the aerospace, defense, semi-conductor, and medical device industries. In business since 1983, the company is AS 9100 and ISO 9001 certified. The company’s website can be found at www.appli-tec.com.